Quality Management Process Awards Ceremony, May 2010, St Louis, MO - Region 3. Photo includes Regional Director Herb Goldstein, Emil Muccin, DRD, and David Levy, DRD, who are all Tappan Zee Section member leaders. This award is presented by the Section Leadership Committee as a means of recognizing an individual or a team that has demonstrated, by their active participation and contributions, their desire to advance the goals of the Society and their member unit or have furthered or are furthering the advancement of the quality profession to the membership, industry, academia, and the community. In 2001 ASQ introduced the Section Volunteer Excellence Award (SVEA). One year later it was renamed the Volunteer Excellence Award (VEA) to include Division leaders. The award was again renamed the Member Leader Excellence Award (MLEA) in 2005. ** J. Spichiger was awarded the VEA by all 10 Sections of Region 3, including Tappan Zee, and the NEQC. Mr. Spichiger was Regional Director of Region 3 at the time that he received this award. A yearly award presented by vote of the Section Leadership Committee for the Member Leader who has made the greatest contribution to the section over the past year in terms of assigned tasks and additional duties. A yearly award selected by the Member Leader Committee from nominations made by ASQTZ member leaders, for the person in the section who has contributed to the field of Quality. A yearly award presented by vote of the Section Leadership Committee for the Committee or Section member who "best exemplifies the finest tradition of ASQ by rendering meritorious service over an extended period of time to the purposes and tradition of the quality profession and section. This person embodies the ASQ precepts of championing the quality movement through the offering of technologies, concepts, tools and training to quality professionals, practitioners and everyday consumers, encouraging all to "Make Good Great." SMP is an ASQ process designed to coordinate the functions of the Section in an effort to provide continuity from year to year as well as provide direction for the Section's Board. In 2002 - 2003, the Tappan Zee Section achieved Total Quality in SMP by fulfilling all requirements of the process. 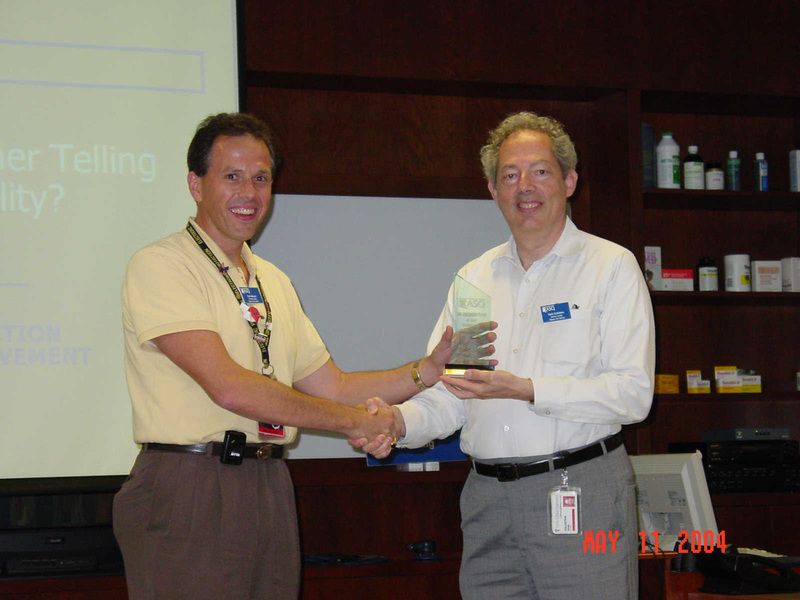 One May 23, 2004 at AQC (American Quality Congress) in Toronto, Ontario, Canada, Emil Muccin, Chair of Tappan Zee Section, was presented the Total Quality Award by Ken Case, ASQ President, David B. Levy, Regional Director Region 3, and Dan Sneizek, SAC Chair, while Liz Keim, ASQ Chairperson of the Board looked on. In 2001 - 2002 ASQTZ received the Total Quality Award in SMP by fulfilling all requirements of the process. On May 19, 2003 at AQC in Kansas City, Emil Muccin, Chair of Tappan Zee Section was presented the Total Quality Award by Jerry Mairani, SAC Chair, Liz Keim, ASQ President, and Jim Spichiger, Regional Director Region 3, while Tom Mosgaller, ASQ Chairperson of the Board, looked on.